This explains an approach for designing Hexawise tests that many new Hexawise users find useful. If you have a long end-to-end process, don't include much detail in your Values yet. If you have a small scope, include more specific detail. 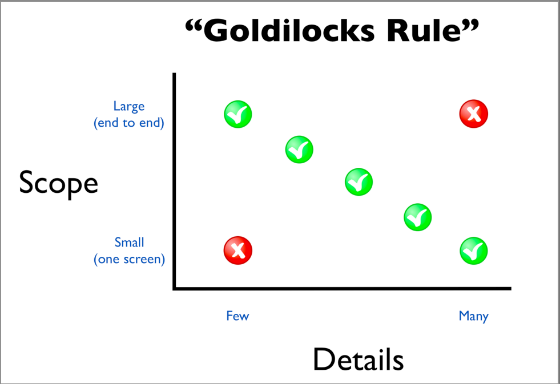 More information about the Goldilocks Rule is here. Suggestion: do NOT start this process with detailed Requirements or technical specifications. Instead, start with your basic, common sense description of some things that would change from test to test. If you were explaining the application to someone's mother, how would you explain what it does in 2 minutes? What kinds of things would be important to vary from test to test? - Hardware and software configurations? - Different actions that a user might take? - How might those things change? Add one or more Values for each Parameter. - At this point, general descriptions might be fine; (e.g., SUVs or Economy cars vs. Toyota Corolla). Remember that, wherever possible, you should avoid creating long lists of Values. What obvious types of scenarios are missing? Add Parameters and Values as necessary to fill the obvious holes. If adding additional details into your plan is "starting to make [your] head hurt..."
Consider exporting the tests from Hexawise while they are still general and add details after exporting from Hexawise. J Michael Hunter's "You Are Not Done Yet"